On election day in November 2018, voters in the State of California, aka the California Republic, will get to decide as to whether or not they want a divorce. Not from their spouses. That’s been going on. Hell, that’s almost a rite of passage in that part of the country. I mean a divorce from their state. Voters will get to decide in this coming mid-term election con-game whether they want to split their state up into three. 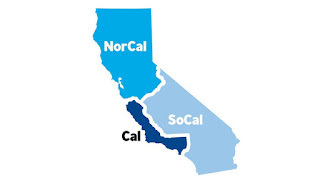 San Francisco and capital Sacramento would be part of “North California”, San Diego would highlight “South California”, and the greater Los Angeles area along with five counties north of it would stay “California”. This radical idea is the brainchild of bitcoin champion Timothy Draper, who originally came up with the idea of splintering California into six states in 2014, but he couldn’t get enough signatures to qualify for the ballot. This time, his re-worked idea of a three-state split got more than enough signatures to qualify for the ballot measure. The idea of breaking up California – the most prosperous of the 50 states, not to mention the third largest in geography – is neither shocking or new. There has been plenty of displeasure in the state for a long time. This is a state that is as dysfunctional as many of the families there. You have a wide variety of interests and demographics from one end to the other and they have a hard time tolerating each other. It was only a matter of time, especially in our growing hyper-partisan fragmented nation, that someone would float the idea of breaking up the “family” and have it stick. And really… maybe it should be broken up. Let’s get brutally honest here… no state in the United States of America was ever meant to be forever. The nation was always created with the idea that its size would change. We’ve always thought of that change as expansion, but it can also very well mean change from within. And if the people of California feel that they are not being represented or governed properly on a state level, then they have every right to either get the representation they feel is due, or else break apart from that state and form a new one. Or two. Now, I can understand why this idea would be terrifying to some people. The liberal faction of the Democrats have had a lock on California politics since forever. Hell, California is one of the key electoral states needed to win the White House. You break that state into three, and you break up the electoral delegates. Texas and Florida, far from liberal bastions, get the political attention. You break up the power structure and the attention when you break up the state. At the same time how many times have we heard the conservative extremists in Texas whine about secession? It seemed like every election over the past two decades, we’ve heard Texans whine and whine and whine about seceding from America. In fact, the only thing that shut them up was that Donald Trump is now President. Funny how a partisan shift would change their minds about America. I also know that even if the voters approve the measure, it’s still far from a done deal. Once approved by the voters, the final decision would still have to be made by Congress in accordance to the U.S. Constitution. You know, that gang of dysfunctional and corrupt sociopaths that can only pass legislation that is either self-serving or serving their special interest buddies and campaign sugar-daddies. The ones who can’t stop spending money and still whine about it. Opponents of the split are relying on that gross ineptitude of Congress to be a “circuit breaker” should they lose in November. After all, if Congress has failed to authorize statehood for Puerto Rico, the District of Columbia, and Guam, then certainly they wouldn’t want to mess with California, right? Why force the flag-makers to change the flag that GOP desecrate every day with their antics? Well how about this reason: because it would actually give them more legislative power in Washington. California currently has two senators and 53 legislators. Split the state into three, and you now have three states, each with two US Senators. Granted, the congressional maps would all have to be redrawn, but given the political leanings in both the areas that would become “North” and “South” California, there is a very good chance that the GOP could pick up at least two new Senate seats from those two “new” states. It would all just be a matter of how those new states would divide up the representation. Now compare that to the other proposed “states”. Guam, Puerto Rico, and the District of Columbia all lean liberal. Give them statehood and you get two Senators for the Dems for each of those territories. That’s six Senators all siding with the Democrats. You can see why a GOP-controlled Congress is not eager to see that happen. Splitting up California, on the other hand, gives them a good chance of coming out stronger. And, certainly, this idea should give other state governments pause, even if it doesn’t succeed. Career politicians have relied on the complacency and apathy of the voters to do whatever they want. This has created a political divide that is getting more and more agitated. This could lead to calls for other states to possibly split up. Imagine, if you will, the states of Florida and Georgia splitting. The Florida Keys have actually seceded from America on at least one occasion! The “Panhandle” part of Florida could easily call it quits if they don’t like what’s going on further south. And there is a noticeable disdain for the Atlanta area through the rest of Georgia. Could there be a “North” and “South” for Florida and Georgia at some point? That’s something to consider. If California does split up, though, they really only have themselves to blame for it. You can only push any kind of idealism for so long before people question whether or not you’re living in the same reality as them. Not everyone likes kale or tofu. Not everyone is a vegan or a vegetarian. And you can’t expect gender discrimination to suddenly end just because of a hashtag shaming movement. Or, for that matter, any kind of discrimination. History has shown time and time again that when governments fail to represent their people, they create the call for revolt. Great Britain learned that the hard way starting with America. America learned that with the Civil War. Hell, we ended up with Donald Trump in the White House because of that. California’s fate now depends on whether or not enough people are pissed off at the way things are to want them to change.